Mechanical Edward, one of last nights waiters, was on breakfast duty this morning, still appearing strangely robotic. Mirinda told him he worked too hard and he gave a knowing nod. The dining room was pleasantly devoid of crowds, being a Monday and there was a surfeit of fried eggs for which I was very pleased – I had 15. Today it was Christchurch College’s turn for a through going over. So it was off up the Thames/Isis. The entrance fee was a whopping £4.50 but that’s only when the dining hall is open. When it’s in use, the price drops to £3! Because the hall was being used we managed to get in for the discount price. For this huge fee you get a lovely guide book and lots of bowler hated guys at each part of the tour. In order to reach the cathedral, we had to walk around the sides of the massive Tom Quadrangle, where the windows stare down. Included are a number from which Lewis Carroll could once be seen, as he moved rooms a bit. 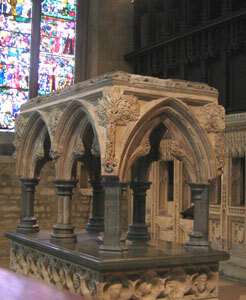 The oldest part of the college is the Cathedral, dedicated to St Frideswide. She is the patroness of Oxford and Oxford University. She died around 735AD having lived a life of perpetual virginity. Apparently Prince Algar didn’t believe her and sought to change her mind. She fled and remained hidden near Oxford for three years and poor Algar was struck blind. At this point the prince gave up chasing her and she returned, praying for his sight to be returned, which it was. Naturally. The cathedral is also the smallest in England. At the door we were accosted by an amazing set of facial hair. This guy was excellent. He recited for us the famous Dr Fell ditty – created by a student who didn’t know why he disliked Dr Fell…but he did. I do not like thee Dr. Fell. Bemused, we wandered round the place, marvelling at its loveliness. St Frideswide’s shrine is given pride of place. It was built in 1289 then destroyed by Henry VIII at the Reformation. It was smashed then chucked down a well. In 1889 it was found and put back together. Burne-Jones (the Pre-Raphaelite artist) designed quite a few of the stained glass windows including a figure of St Catherine of Alexandria. She was an excellent choice of subject as she may have been a romantic fiction created by the Greeks in the 9th century – just the right sort of appeal for a Pre-Raphaelite. Anyway, this Catherine has the face of Edith Liddell, Alice’s sister who sat for Burne-Jones while her father was Dean of the college. On our way out we were once more accosted by Mr Jolly-Hair. He asked, rather secretly, whether we’d heard of Alice in Wonderland(!). He then shuffled over to a curtain and disappeared inside, rattling keys around until a little door opened revealing a beautiful garden. This was the private garden where Alice and Edith would play. And, in a building beyond the garden wall, Lewis Carroll would watch them. The wall is dominated by a big old chestnut tree. Very often, Dinah, Alice’s cat would sit on a big branch and it was this sight that was the inspiration for the Cheshire cat grinning in the tree. We thanked the lovely man profusely – not everyone was shown this special place. For a major Alice fan like me, it was extra special. Leaving the cathedral we walked across to the dinning hall – lunch having finished…or breakfast. There’s an interesting if somewhat painstaking piece of graffiti at the foot of the hall stairs. Someone took the trouble to spell out ‘NO PEEL’ using metal studs rather than paint. This referred to Sir Robert Peel who, in 1829 proposed greater freedom for Catholics. Greater freedom for what, I cannot say. The hall is exactly as it should be, long dark wooden tables with a small stage at one end. All dark and gloomy with little bank lights set in the centre of the tables. We wandered up and down checking out the portraits of the various deans. Harry Potter was filmed here – the meal scenes – and there’s a lot of Alice stuff scattered around if you know where to look. The fire-dogs, for instance, are supposed to be the inspiration for Alice’s growing tall and her neck stretching away. There is also a stained glass window with many of Tenniel’s drawings incorporated into it. Alice’s father, the Dean, would disappear from the high table every night down a secret spiral staircase, just like the White Rabbit down the hole. The most amazing thing about the hall is the portrait of Dr Strange. Artists from all over the world come here to try and figure out how the artist did it. We all know of paintings where the eyes follow you round the room but in this portrait the entire head moves! It’s true! As you walk by, eyes turned towards the painting, the heads seems to move and remain facing you. Very freaky and no-one knows how or why it happens. More than happy, we left Christchurch and accidentally stumbled on The Bear, another recommended (by David & Ben) drinking establishment. Being 11am, Mirinda only had a cup of tea but I figured it was well after lunch in Singapore, so I had a pint of Brakspear. The pub has been around since the 17th century and before that was an ostler’s house NEXT to a tavern which dated back to 1242! The pub has no right angles and has only a couple of small rooms around the bar. It also has an amazing collection of over 4,500 ties. These were given in the early 1950s by celebs and others in exchange for free beer. The ties are all neatly labelled and displayed in glass cases. There are signs everywhere stating that the practice of free beer for ties is no longer an option. I assume this is because there’s no more room for any more ties. After an energising beer, I left Mirinda to rummage through the exciting undercover market while I climbed the Carfax Tower. The original tower was built around 1032 and was part of the Church of St Martin. The present tower, however, is the only surviving part of a medieval church from around the 13th century. In 1896 the church was demolished, leaving the tower for us silly tourists to climb! The name ‘Carfax’ is from the Latin for ‘four-forked’ or the Norman French for ‘four ways’. This is because it was once the heart of Oxford with the roads spread out north, south, east and west beneath it. The climb was up a narrow, steep, continuous spiral tunnel and you wind up on a wooden timber strip running beside the lead roof of the tower itself. The spires of Oxford are very obvious from this vantage point. They thrust up in every direction from between the modern buildings. I’m sure it looks fantastic on a bright sunny day. Anyway, I looked then zipped back down, met Mirinda then went to Debenhams so she could find a loo! Actually I left her in Debs and popped into St Mary Magdalen’s church. It stands outside the original city walls and, apparently was burnt down by Vikings around 1010. This was because it was made of wood and we know how much they loved a barbi. In 1074 a chapel was built on the original foundations by Robert d’Oilli (I assume he had frilly bits around his edges and was used for tea cups). Richard the Lionheart was quite keen on the place and allowed the parish to fly a standard with the crescent and star, to mark his 3rd crusade. There are some interesting bits and pieces in the church, including an elaborate font from around 1350 (still used for baptisms) and a wooden chest which dates from the 14th century. This chest was damaged by a prisoner during the Civil War so Charles I, for some reason, ordered it be repaired in 1643. For this reason (I’m guessing) the church remained staunchly Royalist throughout the Cromwell years. But I couldn’t hang around studying church history all afternoon! I met Mirinda and we darted into a nearby Costas for a coffee before moving down to St Michael’s at the North Gate to hear William Carslake (baritone) sing Bach, Handel and Purcell. My God! It was beautiful. A beautiful voice in a beautiful church singing beautiful music. For his final song, William suggested we close our eyes (“Close ye now, ye weary eyelids…“). I did and it was worth it. Although he was singing in German, it didn’t matter, the feeling came through. Peace was there behind my eyelids, safe before his lullaby. He received a resounding applause from the meagre audience. If you are ever in Oxford and see ‘Free lunch time concert at St Michael’s at the North Gate’ go along, it’s fantastic! Nice choice Mirinda! From St Michael’s it was but a second to the Eagle and Child but Mirinda decided we should go via a giant detour to Oxford Castle – a weird spot dedicated to various County Hall buildings, ancient mounds and trendy restaurants. Having scouted out somewhere trendy to eat we hiked back to the pub. The Eagle and Child is where, every Tuesday morning between 1939 and 1962, JRR Tolkien, CS Lewis and other writers, known collectively as the ‘Inklings’ would meet to discuss, debate and chat about orcs and elves and talking lions. I was a bit disappointed with the selection of ales (I had a Broadside) and the back part (built in the late 1950s) was a bit erky. Still, the landlord seemed a jolly chap and the place is very popular. After a drink we left for the covered market where Mirinda had found a café she fancied for a very late lunch. A panini and nachos later we left, heading back for the hotel via the Alice Shop (of course) which I’m sure has moved since the last time we were in Oxford. Dinner was eaten in our room (good old room service) as we couldn’t be bothered going out again. Food was yum, telly was ok. This entry was posted in Gary's Posts, Oxford 2006. Bookmark the permalink.